I am broadly interested in the biodiversity of the southeastern United States especially that of natural grasslands in the region. I consider myself both a taxon scientist and ecologist as most of my research entails documenting and describing the biogeography, diversity, and ecology of the ant and grasshopper fauna of these habitats. The southeastern United States is a hotspot for biological invasion, due to the large number of international shipping ports in the region. For example, the imported fire ants,Solenopsis richteri Forel and Solenopsis invicta Buren, and potentially several other exotic ants, entered the United States via the port of Mobile in the early part of the 20th century. The ant research at the MEM is headed up by Joe MacGown. 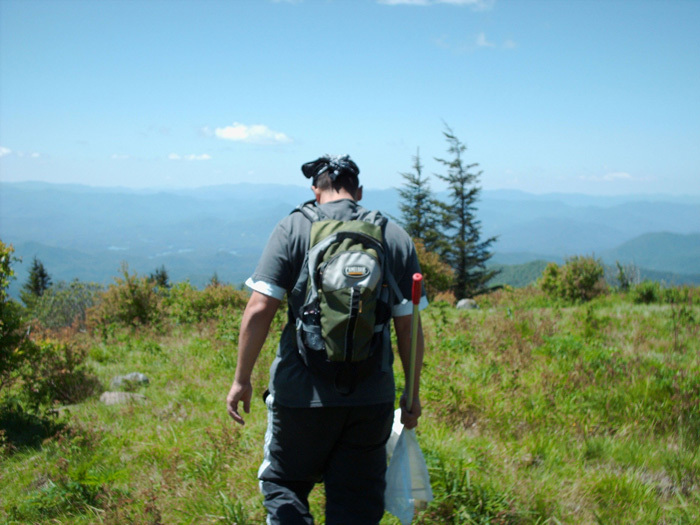 Together, he and I have traveled throughout the southeastern United States sampling ants to gain a better understanding of the fauna of the region. This project is designed to document the distribution of native and exotic species of ants, so that future range changes may be detected and to detect the prescence of any new introductions. Additionally, I have conducted studies investigating habitat parameters that are correlated with ant community composition and the effects of prairie restoration techniques on ant communities. One would think the fauna of the southeastern United States would be relatively well documented, especially for organisms of relatively large size such as grasshoppers. However, such is not the case. For the last 12 years I have been working toward producing a faunal treatment of the grasshoppers of the southeastern United States. In that time I have made significant collections over most of the region, documenting species distribution, and in the process have discovered close to 30 undescribed species, all of which belong to the subfamily Melanoplinae. The Melanoplinae is the largest subfamily of grasshoppers in the Southeast and contains numerous short-winged species that are incapable of flight. Recently my research has focused on taxonomic revisions of several species groups in this the genus Melanoplus and I am finding that the Coastal Plain and Interior Highlands, both classical areas of endemism, are rich in cryptic species in this genus. In the future, I plan on working on the biogeography of the southeastern Melanoplus in an attempt to explain what vicariant events may have led to speciation in the region. Grassland habitats in the southeastern United States are rich in rare and endemic species and significantly contribute to the biodiversity of the region. These grasslands are also some of the most imperiled habitats in the region, making the study of their biota and ecosystem function of the utmost importance. I have published papers documenting the ant and grasshopper fauna of grassland systems Alabama, Georgia, Mississippi, Tennessee, and Texas. 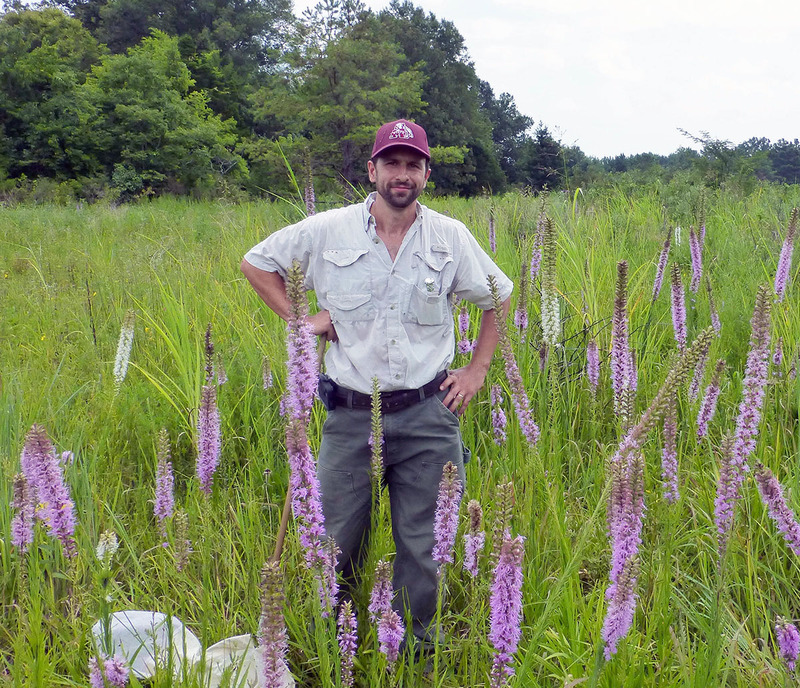 Since 2000, Dr. John Barone and I have put forth a large collaborative effort to study the biota and ecology of Black Belt Prairies in Mississippi and Alabama. Currently we, along with several others, are utilizing DNA barcoding to understand the diets of grasshoppers in these grasslands. In 2012, I helped organize the Southeastern Prairie Symposium, which sought to bring together researchers working in both natural and working grasslands in the Southeast. John Barone and myself are currently editing a book based on research presented at the symposium. Jones, J.J., J.G. Hill, and R.G. Hamrick 2014. Managing native grasslands. pp. 71-102 in Rohnke, A.T. and J.L. Cummins (eds) Fish and Wildlife Management: A Handbook for Mississippi Landowners. University Press of Mississippi, Jackson 418 pp. MacGown, J. A., J. K. Wetterer, and J. G. Hill. 2012. Geographic spread of Strumigenys silvestrii (Hymenoptera: Formicidae: Dacetini). Terrestrial Arthropod Reviews 5: 1-10, published online, DOI:10.1163/18749836-05031051. MacGown, J. A. and J. G. Hill. 2010. A new species of Pyramica Roger (Hymenoptera: Formicidae) from Mississippi, U.S.A. Florida Entomologist. 93: 571-576. MacGown, J. A., J. G. Hill, and M. Deyrup. 2009. Ants (Hymenoptera: Formicidae) of the Little Ohoopee Dunes, Georgia. Journal of Entomological Science 44: 193-197. MacGown, J. A., J.G. Hill, and M. A. Deyrup. 2007. Brachymyrmex patagonicus (Hymenoptera: Formicidae), an emerging pest species in the southeastern United States. Florida Entomologist 90: 457- 464. Hill, J. G. and J. L. Seltzer. 2007. A note on additional plants found at Sixteenth Section (Osborn) Prairie. Journal of the Mississippi Academy of Science 52: 295-297. Hill, J. G. 2006. Field observations of Pheidole pilifera (Roger) and Paratrechina arenivaga (Wheeler) (Hymenoptera: Formicidae) in a Black Belt Prairie remnant in Mississippi. Journal of the Mississippi Academy of Sciences. 51: 183-186. MacGown, J. A. and J. G. Hill. 2006. The Eastern ant cricket, Myrmecophilus pergandei Bruner (Orthoptera: Myrmecophilidae), reported from Mississippi, U.S.A. Journal of the Mississippi Academy of Sciences. 51: 180-182. Hill, J. G. and B. V. Brown. 2006. New records of the rarely collected ant-decapitating fly Apocephalus tenuipes Borgmeier (Diptera: Phoridae). Southeastern Naturalist 5: 367-368. MacGown, J. A., R. L. Brown, and J. G. Hill. 2005. An annotated list of the Pyramica (Hymenoptera: Formicidae: Dacetini) of Mississippi. Journal of the Kansas Entomological Society. 78: 285–289. Dakin, M. E. and J. G. Hill 2007. A preliminary list of the Orthopteroid insects of the Great Smoky Mountains National Park. (Abstract) Journal of the Mississippi Academy of Sciences 51: 152. MacGown, J. A., J. G. Hill, and R. J. Jones. 2007. Ants in Mississippi State Parks. Abstract. Journal of the Mississippi Academy of Sciences (Abstract) 51: 152. Hill, J. G. and R. L. Brown. 2005. The first record of the genus Polyergus (Hymenoptera: Formicidae) in Mississippi. Journal of the Mississippi Academy of Sciences 50: 120. Barone, J. A. and J. G. Hill. 2006. Floristic affinities of black land prairies in Mississippi and Alabama. (Abstract) Southeastern Biology. 53: 291. MacGown, J. A., R. L. Brown, and J. G. Hill. 2006. Carpenter Ants (Camponotus) of Mississippi [Abstract]. Journal of the Mississippi Academy of Sciences 51: 115. Hill, J. G., R. L. Brown, and J. A. MacGown. 2006. Environmental Variables Affecting Ant (Formicidae) Community Composition in Mississippi’s Black Belt Prairie and Flatwoods Regions [Abstract]. Journal of the Mississippi Academy of Sciences 51: 56. Hill, J. G., R. L. Brown, and J. A. MacGown. 2006. Environmental Variables Affecting Ant (Formicidae) Community Composition in Mississippi’s Black Belt Prairie and Flatwoods Regions [Abstract]. Southeastern Biology 53: 279. Jones, J., D. Coggin, J. Cummins, and J. Hill (in press) Prairie Restoration Handbook for Mississippi. Wildlife Mississippi, Department of Wildlife and Fisheries, MSU, and US Fish and Wildlife Service. 65pp. Hill, J. G. 2007. Observations of Neivamyrmex fallax Borgmier and Solenopsis xyloni McCook (Hymenoptera: Formicidae). Marginalia Insecta 2: 2 (3 April, 2007). Hill, J. G. 2007. The grasshoppers (Orthoptera: Acrididae) of the Bibb County Glades, Alabama. Marginalia Insecta 2: 1 (January 8, 2007). MacGown J. A. and J. G. Hill, 2007. Rediscovery of the Florida harvester ant in mainland Mississippi. Newsletter of the Mississippi Native Plant Society and the Mississippi Environmental Education Alliance 25:2. Hill, J. G. 2006. The life cycle of a mosquito and how I use it as a Betta Breeder. Flare 39: 13-14. Hill, J. G. 2006. The First Record of the Green Stinkbug Chlorochroa persimilis Horvath (Hemiptera: Pentatomidae) from Alabama. Marginalia Insecta 1: 2. (13 October 2006). Hill, J. G. and J. A. MacGown. 2008. Survey of Grasshoppers and Ants from the Big Hammock, Ohoopee Dunes, and Fall Line Sandhills Natural Areas. Report to the Georgia Department of Natural Resources. 30 pp. Jones J. C., K. Edwards, T. Harris, S. Gallagher, J. Fogarty and J. Hill. 2007. Surveys and Recommendations for Conservation of Rare Fauna and Upland Prairies of Tombigbee National Forests, Tombigbee Ranger District, Mississippi. Department of Wildlife and Fisheries and Department of Entomology, Mississippi State University 110 pp. Hill, J. G. 2007. The grasshoppers (Orthoptera: Acrididae) of the Bibb County Glades, Alabama. Submitted to Chris Oberholster of the Nature Conservancy, Alabama Chapter. Brown R. L. and J. G. Hill. Report of Collection made by the Mississippi Entomological Museum on public lands in Texas. Submitted to David Riskind of Texas Parks and Wildlife Department. Brown R. L., J. G. Hill and J. A. MacGown. Report of Insects Collected on Mississippi Public lands. Submitted to the Mississippi Natural Heritage Commission. Hill, J. G. Collections of Melanoplus stegocercus Rehn and Hebard (Orthoptera: Acrididae) in Georgia State Parks. Submitted to Cindy Rettinger of the Georgia State Parks and Historic Sites. MacGown J. A. and J. G. Hill. Ants in Roosevelt State Park, Scott County, Mississippi. Submitted to the management of Roosevelt State Park. Hill J. G. and J. A. MacGown. Grasshoppers collected at the Deaton Preserve, Greene County, Mississippi. Sent to Rebecca Stowe of the Nature Conservancy. Hill J. G. Ants collected at Okatibbee Lake, Lauderdale County, Mississippi. Sent to Van McWhorter of the U. S. Army Corp of Engineers. MacGown J. A and J. G. Hill. Ants collected at Palestinian Gardens, George County Mississippi. Sent to Rebecca Stowe of the Nature Conservancy. MacGown J. A. and J G. Hill. Ants collected at the Deaton Preserve, Greene County, Mississippi. Sent to Rebecca Stowe of the Nature Conservancy. Hill, J. G. and J. L. Seltzer. 2010. Insect Collecting at Night. The Elsie Quarterman Glade Festival, Cedars of Lebanon State Park. April 30 - May 1, 2010. Hill, J. G., J. L. Seltzer, and J. A. MacGown. 2010. Insect Collecting Methods. The Elsie Quarterman Glade Festival, Cedars of Lebanon State Park. April 30 - May 1, 2010. Barone, J. A. and J. G. Hill. Plant community composition and structure of remnant blackland prairies in Mississippi and Alabama. Association of Southeastern Biologist Annual Meeting, April 18-21. Oral Presentation. Hill, J. G. 2006. Ants and Environmental Variables That Affect Their Community Composition. Presentation to the Biology Department of Columbus State University, Columbus, GA. 6 April 2006. Oral Presentation. Hill, J.G., R. L. Brown; and J.A. Barone. 2005. The Black Belt Prairie of Mississippi and Alabama. 11th Symposium of the Natural History of the Lower Tennessee and Cumberland River Valleys. Oral Presentation . Hill, J.G. 2004. The Ant Fauna of the Black Belt Prairie and Flatwoods Regions of Mississippi. Mississippi Entomological Association annual meeting. Oral Presentation. Co-recipient of the 2009 Mississippi Chapter of the Wildlife Society's Outstanding Book award for Restoring and Managing Native Prairies: A Handbook for Mississippi Landowners with Jeanne Jones, Daniel Coggin, and James Cummings. The vascular flora of Lauderdale, County, Mississippi U.S.A. with Lucas Majure, Chris Doffitt, and Terence Majure.